The Ksav Sofer writes that history concerns the nature of nations and how they fall into one of three categories. Either they are the conquerors; or they are the conquered and serve another nation or the third type which applies to the majority of nations, is none of the above. They do not conquer nor do they become the conquered, they just exist to themselves. The history of the Jewish people however differs. History has shown over and over again that the state of Am Yisrael portrays a duel character, one that fluctuates between periods of conquering and dominion and periods of being the downtrodden nation that is enslaved and subject to others. Never have we found Yisrael to be in the third category of being not the conqueror nor the conquered. What is it about our peculiar nature that we don’t fit into the all encompassing historical formula? This recognition of our unique role in history from amongst all the other nations was acknowledged even by the prestigious British historian Arnold Toynbee (1889-1975) who through his controversial theory on civilizations became known to be an “anti-Semite.” According to his theory published in twelve volumes with more than 3 million words, he stated that civilizations, like human beings, have life cycles that are marked by rises and falls. But the story of the Jewish people, who were determined to survive 2,000 years in the Galus only to rise again as a modern nation, did not suit his theory. Thus Toynbee described the Jews as a historic “fossil” – not dead, true, but also not really alive. What does a gentile know about Jewish History even if he is highly educated, brilliant and an outstanding historian to boot? Absolutely nothing! To the naked eye and with only an external look alone, history is only a hester, a concealment and the inner truth is cloaked over. It is like trying to analyze the functions of the body without realizing the existence of a heart which is its life force. Omitting Hashem from events is the greatest hester and delusion for by doing so one is removing the true cause and effect relationship that brings about what we call history. Interpreting historic events by seeing them through the lens of the Torah, with the ruach hakodesh of Chazal and the meforshim, Toynbee’s fossil nation suddenly becomes more alive and perpetual than any other nation that ever existed or that will ever exist in the future. Even Yisro who heard all about Yetzias Mitzrayim as the first passuk in his parsha attests to, nevertheless when he met Moshe the passuk says (Shmos 18,8) that Moshe retold him the story of Yetzias Mitzrayim. Only then ויחד יתרו Yisro rejoiced. There is a tremendous difference between hearing the same events interpreted by goyim and sometimes even Yidden and between listening to its interpretation by a Gadol Hador. Let us examine the opening pessukim of our parsha in the light of Kesav Sofer’s explanation and we will see contrary to Toynbee that it is every other nation who are the historic fossils of humanity and that only Am Yisrael alone are alive, thriving and eternal. In derech melitzah we can say that we apply to Toynbee the dictum of Chazal (Kiddushin 70b) כל הפוסל במומו פוסל anyone who fossils someone else really points a finger at himself projecting that he himself is the fossil. The Ksav Sofer writes that the answer to his question why Am Yisrael is the only nation that deifies the irrefutable pattern of history is very simple. The nations of the world are influenced by the mazal and zodiac. Sometimes the constellations are in their favor and they rise and sometimes not and they fall and many times neither. This is in contrast with Klal Yisrael whose very existence is above the zodiacs and celestial bodies and they receive their direction and influence straight from Hashem alone. Therefore for us there are only two choices. The preferred choice is to fulfill the miztvos that He commands which rewards us with being superior over all the nations as the passuk says (Devraim 26,19) ולתתך עליון על כל גויי הארץ. It is then that we are crowned to be His Am Segulah and held in high esteem by the nations of the world. The only remaining scenario is that if we fail to observe the Torah we will become the conquered, descend into galus, and suffer until we do the teshuvah that Hashem desires. This is the meaning of the opening passuk of the parsha. ראה אנכי נותן לפניכם היום ברכה וקללה I am giving before you beracha and curse. This declaration says clearly that unlike the nations of the world there are only two choices. Your beracha can only come אשר תשמעון by listening to what I command you. The curse will befall you when you don’t listen to Me. You are unique from all other nations that can just remain in a “Parve” state for years, Stalemate, not affected by others and not affecting them but just “doing your own thing”. Minding your own business does not exist in Jewish history vocabulary. Am Yisrael will always be the center of world news either as the conqueror or the conquered. We will rise and fall, control or be controlled but we will never find ourselves off the seesaw. Our history is determined by our actions and commitment to Hashem for good or for bad. Our heights and lows are in our hands alone contingent upon our moral choices. א”ר אלעזר הסייף והספר ירדו כרוכים מן השמים אמר להן אם תעשו מה שכתוב בספר הזה אתם ניצולים מן הסייף הזה ואם לא תעשו אתם נהרגים בסייף הזה ד”א אם תאבו ושמעתם א”ר לוי למה”ד לעבד שאמר לו רבו הרי מונייק של זהב ואם לאו הרי כבלים של ברזל כך אמר הקב”ה לישראל אם עשיתם את רצוני הרי הטוב והברכה ואם לאו הרי הקללה הרי שתי דרכים לפניכם ראה אנכי נותן לפניכם היום ברכה וקללה. There are only two choices for Am Yisrael the sword or the sefer. If you choose the sefer you will be saved from the sword. If you choose not to observe the sefer you will receive the sword. This awareness of the existence of only two polarized realities the sefer or the sword was the 24/7 driving force of the lives of our Avos that merited them to become the spiritual DNA of Klal Yisrael as it stands today. An allusion to this is that ספר סייף are gematriah 502 which are the total number of years that the Avos lived, 175 Avraham,180 Yitzchak, 147 Yaakov. If one however delves into Chazal he will discover that this issue of Yidden not being affected by mazal is not as simple as it seems. In Shabbos 156 we find an argument whether the rules of mazalos apply to Am Yisrael. One Amorah is of the opinion אין מזל לישראל that we are not affected by the zodiac and the other one says יש מזל לישראל. Tosfos asks from a gemarah in Moed Katan 28 against the one who is of the opinion that there is no mazal for Yidden why then do we find Rava clearly stating that children, life, and sustenance depend upon mazal and not on merits? Tosfos answers that this statement of Rava that these three are not dependent on merits really means that they are not dependent upon regular merits but rather it requires special merits to block the influence of the mazal. From this we see that even the one who is of the opinion that Am Yisrael are not bound by the influence of the natural forces, he never meant in an all-inclusive way. His intention was rather to say that we still remain to some extent under their influence in such areas as birthing children, life and sustenance if we only possess insufficient merits to change their given destiny. However, if we can muster up greater zechusim with more fervent tefillos we have the ability to change even the mazal’s leaning upon us. The gemarah in Berachos 28 says that our eighteen berachos of the Shemoneh Esrai is derived from the eighteen names of Hashem that are mentioned in our perek 29 of Tehillim. The gemarah goes on to learn out in detail how the berachos are actually alluded to in the pessukim. The first beracha which is called Avos parallels the first passuk in the perek הבו לה’ בני אלים because the Avos are called אלים (Rosh Hashanah 32). Why did Dovid Hamelech alter their title by calling themאלים which is a description of their power rather than the more frequently used title of Avos? In the sefer Shemen Rosh (vol. 2 p. 158) he explains that a person might second guess himself asking why am I davening to Hashem for Him to change my lot if the mazal that I was born under dictates my the birth of children, quality of life and amount of parnassah? It is for this reason that the Anshei Keneses Hagadolah established the first beracha of Shemoneh Esari with the subject of the Avos paralleling it to Dovid Hamelech’s perek in Tehillim who gives them the title ofאלים for the purpose of strengthening one’s resolve to invest himself with a powerful tefillah. For Dovid Hamelech also had this in mind when he titled the Avos with the name אלים which is the acronym יש מזל לישראל אין. This is to make the mispallel cognizant of the fact that even though there is a determining mazal to Yisrael, with great effort and sacrifice and with special merits and sincere heartfelt tefillos, one can actually change it. The Avos have inherited this power to all of their descendents. An allusion to this is the gematriah of the word אליםincluding its inner letters. אלים is gematriah 81. The aleph contains the letters of לף, the lamid contains the letters of מד,the yud contains the letters of וד, and the mem contains the letter of מ. The gematriah of these inner letters equals 204. Together the full gematriah of אלים is 285. The gematriah ofבנים וחיים ומזון is also 285. Even though these three areas are affected by mazal, the Yid has the ability to go beyond his limitations and bring about a greater shefa from above. We can extend this thought even further. Every person is born with a tailor made set of qualities, character, intelligence, personality, talents, pluses and minuses etc. There are people who complain about their lot that they were not born with a higher level of intelligence and therefore learning Torah is too difficult and challenging for them. It is important for them to realize that sincere tefillah and sacrifice can alter even one’s intelligence. Let us take for example the building of the Mishkan. The Medrash says (Shmos Rabba 48,3) on the passuk “See that Hashem called in the name of Bezalel the son of Uri the son of Chur”. The Medrash asks why mention Chur the grandfather? It is to teach us the reason how was it possible that Bezalail who was only thirteen years old at that time, nevertheless supernaturally possessed the wisdom to construct the Mishkan and all its vessels. It was because his grandfather Chur sacrificed his life to restrain Yidden from making the Aigel Hazahav that his grandson merited to receive such incredible wisdom even though his personal mazal did not dictate so. That is why the passuk (Shmos 35,35) uses the term מלא אותם He filled them with chachma. 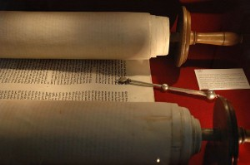 By using the word מלא the Torah alluded to its acronym אין מזל לישראל. Even though the mazal did not favor the granting to these individuals exceptional wisdom, Hashem felt that they were worthy of meriting it. Everyone has the potential to overcome his limitations and overpower his personal mazal. This is Hillel’s famous message (Pirkei Avos 1,14) אם אין אני לי מי לי if I am not for myself then who will be it for me. There is no duplication in creation. Every person is unique with his special one time mission that never was and will never be again since creation. A person should never say that he was born or raised spiritually, emotionally, or psychologically handicapped which set him on the path of failure in his mission. We must always remember even if you think it is true you still have the ability to rise and attain the level of אין מזל לישראל the letters ofמלא which are the same letters of the acronym אם אין אני לי מי לי. So now to return to the question, are we or aren’t we under the influence of the mazalos? Klal Yisrael as a nation is not under a mazal. It was with the understanding of this concept that the Ksav Sofer wrote his interpretation on the first passuk of the parsha. As far as individuals, there are differing opinions. Tosfos however brings that even if we are under the mazal’s influence, with super tefillah and merits one can override even the mazalos. This would answer the question how does one wish another person with the beracha of mazal tov? Either the particular time of the simcha is under the influence of a good mazal or a bad one, so what does it mean you wish that it should be a good mazal. We must say that in this wish of mazal tov one is really being mispallel that the baal simcha should acquire sufficient merits to change the mazal to good even though it might have been bad. Mazal Tov to all of us. I couldn’t continue reading beyond this point. Mazal and zodiac are relics of ancient and ignorant superstition. Does Judaism really believe in the primitive idea that horoscopes, zodiacs, and the positions of the planets are influences in historical events ? Can’t you make a great and valid point, the existence and perseverance of the Jewish People throughout history, without invoking superstitious nonsense?